Analysis / conclusion: Note the last bullet point of the sentiment charts – it sums up my own thoughts precisely. 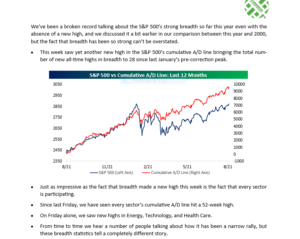 This blog’s piece written on July 20, 2018 relating to market sentiment wasn’t as articulate as Bespoke, but the “sentiment factor” continues to play a vital role in keeping a bid under stocks in my opinion, that and SP 500 forward earnings estimates too. My own take on all of this is that with the market “quietly” making new highs the last two days, the “1998” residue lives on. 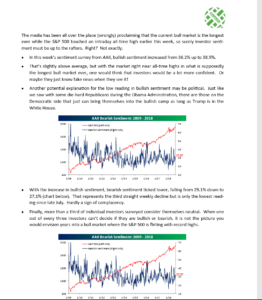 Breadth and sentiment – two often-overlooked factors of market pundits.